Quayside Isle – The Perfect Gateway for Intimate Get-togethers This Festive Season! Looking for an intimate location away from the crowds for a Christmas get-together with closed ones to catch up and reminisce? Look no further! Quayside Isle offers this option, complete with a variety of international cuisines, from Belgian to Thai. Boarding the free shuttle bus towards Quayside Isle is like stepping into another realm, and putting my holiday cap back on. Being away from the hustle and bustle of the main attractions at Sentosa, dining along Quayside Isle’s waterfront can be an intimate affair. Diners at Quayside Isle are mostly looking for quality, uninterrupted companionship, where you can freely indulge and catch up with friends, family or a lover. A casual Belgian Mussels and Beer bistro specialising in Belgian cuisine, BRUSSELs SPROUTS certainly brings out the true Belgian experience. 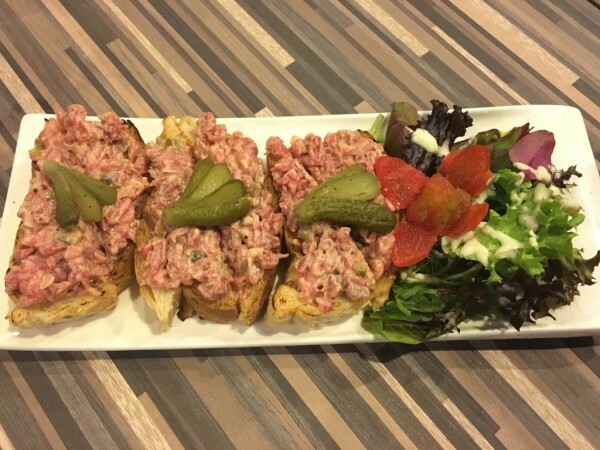 For the starters, we were presented with Beef Tartare on Toast, Belgian Rollmops, Crispy North Sea Shrimp Croquettes and Homemade Belgian Cheese Balls. The Belgian Rollmops – marinated herring with homemade potato salad – is one of the Belgian favourites besides mussels. 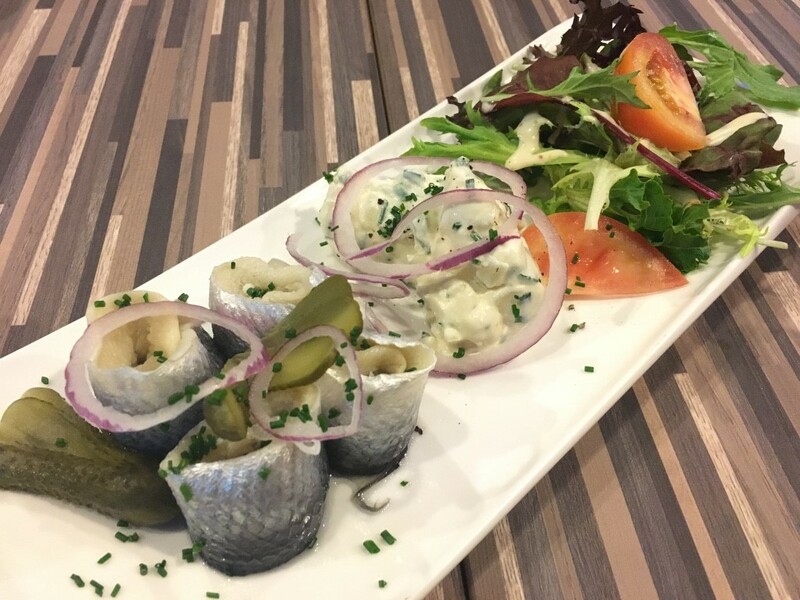 Imported from Brussels, the herring is cured in vinegar and lime to preserve its freshness and retain the taste of the fish. If you’re a fan of raw fish, you’d definitely want this on your order list. The highlight of the night has got to be the mussels! BRUSSELs SPROUTS serves a range of mussels sauces, running the gamut from light White Wine broth to creamy Blue Cheese broth, there is definitely something to satisfy every palette within the 12 different choices. To cater to the Asian tastes, they even pair Tom Yam flavour with the mussels. Mussels are traditionally served with fries and mayonnaise, and their Belgian fries certainly do not disappoint. Do not be deceived by its chunky size. Despite the thickness of each fry, it retains the crispness on the outside and the softness in the inside. 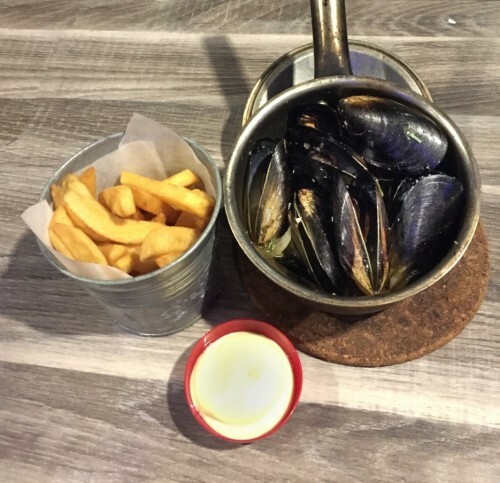 To keep to its tradition of pairing mussels with fries, the fries are refillable. This Beef Cheek Stew exudes an aromatic smell when served. It is braised in Leffe Brune, hence the name Slow-cooked Leffe Brune Beef Cheek Stew. 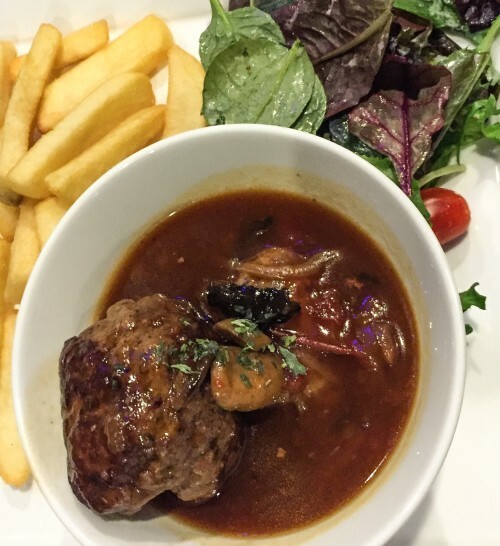 Though the portion served was slightly small, the stew was flavourful and the meat was served soft. The grilled pork sausages is a great dish to share for its generous and thick portions. 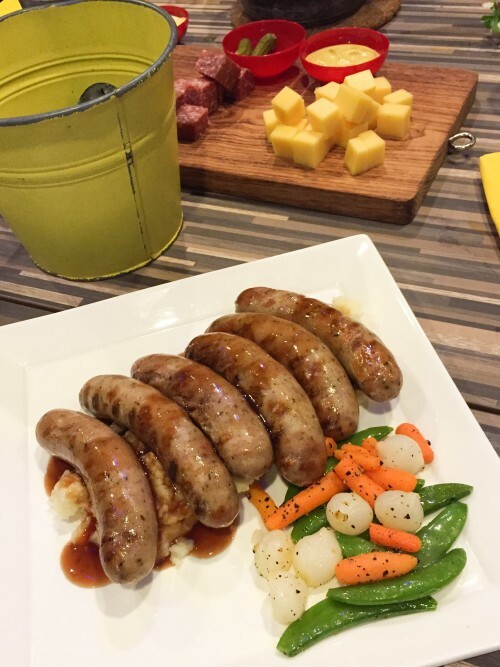 Cooked with red wine sauce and stoemp, a Brussels variant of pureed or mashed potatoes, these sausages simply spell delicious. For the daredevils, my personal recommendation would be the Blue Cheese broth. Banish your preconceptions of what blue cheeses are supposed to taste like. This Blue Cheese broth tastes like no other and goes surprisingly well with the Australian blue mussels. If you would rather veer on the safe side, the Lobster Bisque broth is a crowd-pleaser. This creamy sauce also acts as a great dipping for the Belgian fries. What else is Belgium famous for if not for their beers? 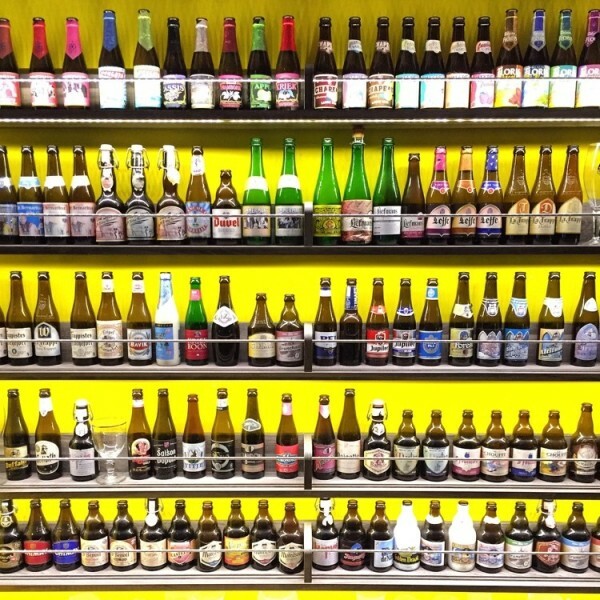 Carrying close to 150 different types of beer, this is heaven on earth for beer connoisseurs. Stella Artois, Hoegaarden White and Leffe Blonde are some of the more common Belgian beers you can find around Singapore. However, if you’re looking for authethic, quality Belgian beers, you should give Hoegaarden Rosée or Lindermans a shot. Timings accurate as at time of publication. 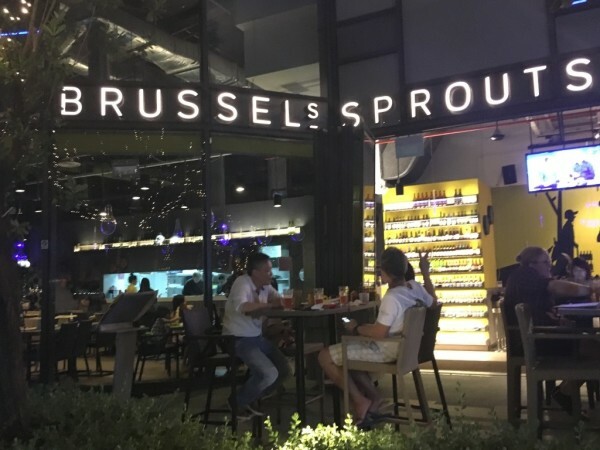 Please call BRUSSELs SPROUTS at +65 6684 4344 to check for updated opening hours. The newest kid on the block, at only a month old, Gin Khao Bistro serves a variety of contemporary authentic Thai dishes that suits all taste buds. My personal favourite is the Watermelon Fried Rice. We’ve heard of pineapple fried rice. But watermelon fried rice? Khao Phat Dtaeng Moe, as it is called in Thai, is Gin Khao’s signature dish, and is also fast becoming one of their more popular dishes among patrons. 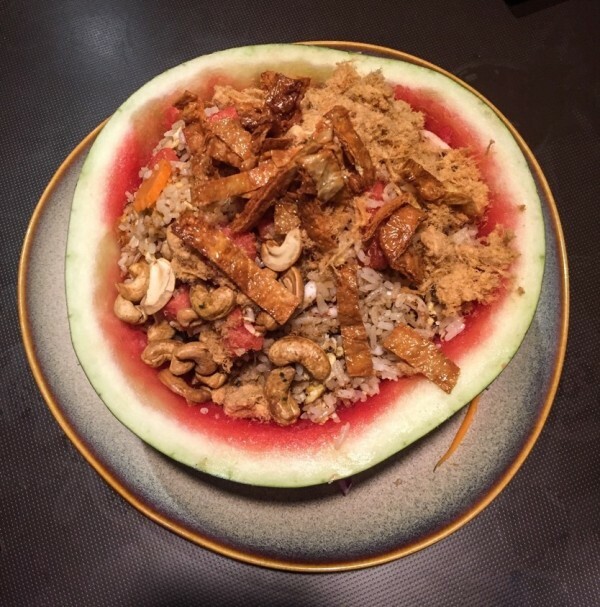 The Thai fried rice is served atop a hollow watermelon bowl, with generous servings of pork floss, cashew nuts, seafood, and of course, watermelon cubes. 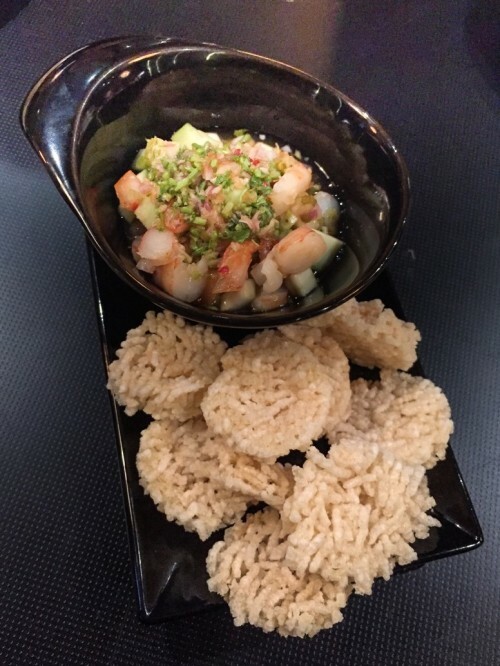 The watermelon cubes adds to the sweetness of the fried rice, making you hungry for more. As Asians, rice and noodles are the only constant in our meals. 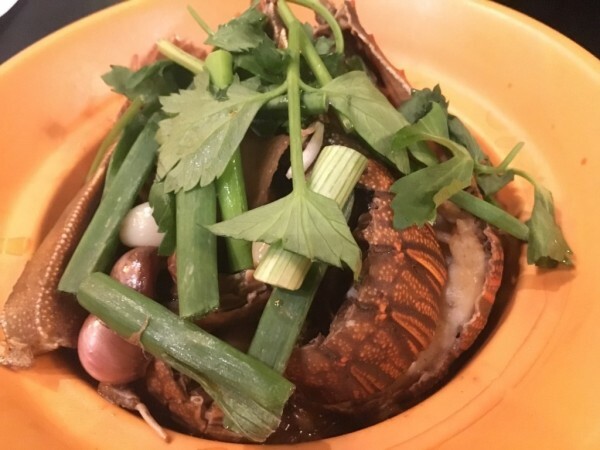 If you are a fan of seafood, I would recommend the Crayfish with Glass Noodle or Kang Ob Woon Sen as it is known in Thai. Meticulously simmered in Thai garlic and pepper sauce over high heat, the dish is a definite Chef’s Recommendation. A recommendation for a starter the Prawn and Green Mango Relish dish. Paired with Thai rice crackers, this dish is a refreshing starter. The sauce’s sourness and spiciness is complemented in the right amount, invigorating your senses when you dip your rice crackers in. 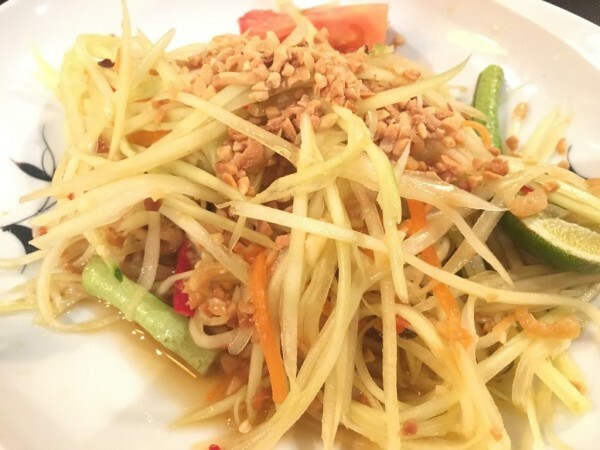 At Gin Khao, we got to try two of their signature salads as well – Som Tam (Mango Salad) and Larb Moo (Minced Pork). 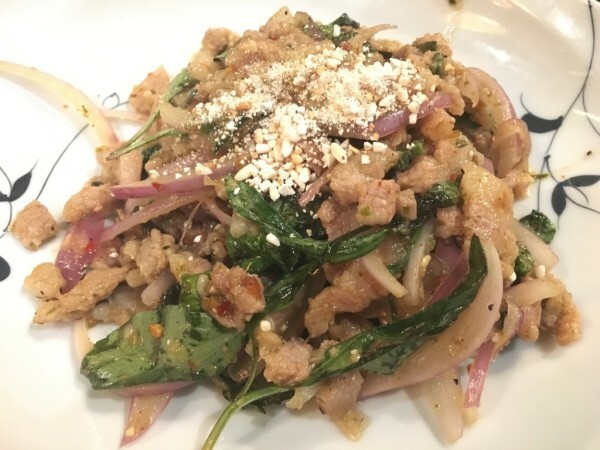 It was interesting take between both dishes as the Som Tam delivers a tangy bite to it while Larb Moo offers more to those who love their meat. 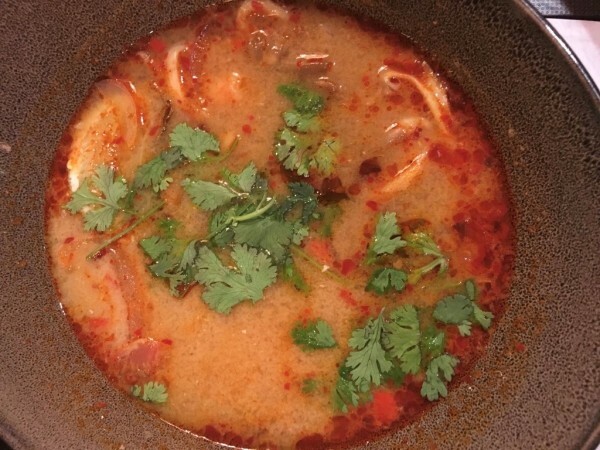 What’s Thai cuisine if you don’t have Tom Yum soup on your must-have list? Unlike the usual clear taste of herbs and spices, Gin Khao’s customised Tom Yum Seafood soup weighs more on the sweeter side to cater to the Caucasians who frequent Quayside Isle for dining. For grills, we got to try the Stir Fried Squid with Runny Salted Egg. 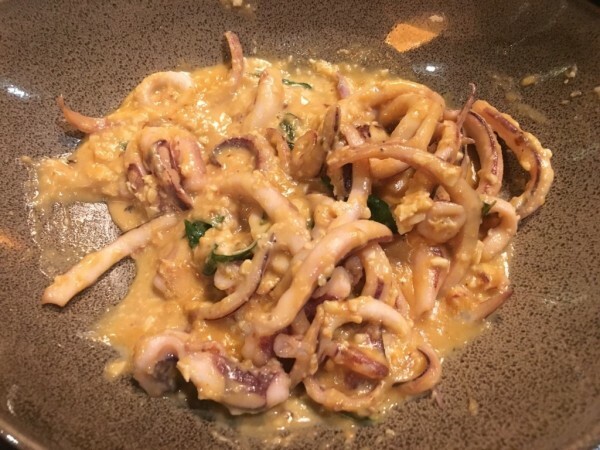 Unlike the conventional cooking style of frying the squid in batter, the squids were coated and pan-seared in savoury salted egg cream. For someone who enjoys salted egg in almost all dishes, I recommend this dish to those who are looking to try out something new. For you sweet tooths, you will be spoilt for choice with the 10 dessert selections Gin Khao Bistro offers. 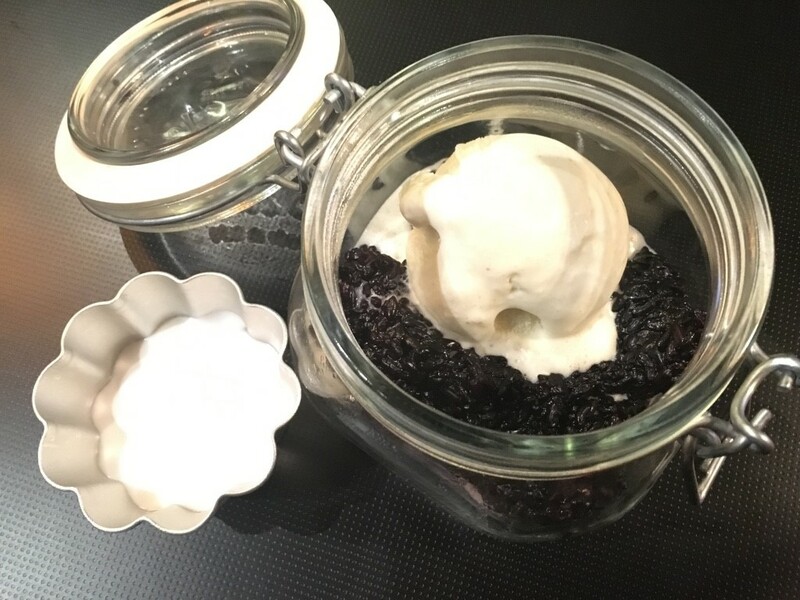 If you enjoy savoury and sweets packed together in one dish, the Mango with Black Sticky Rice exudes a balanced combination of both. Since the restaurant ran out of mangoes, we had the chance to taste the delectable flavour of their Green Curry Ice Cream. I found the taste of the ice cream queer, and could not get used to the taste. Mixed with the black sticky rice, it really makes one wonder if they are having their mains or desserts. Timings accurate as at time of publication. Please call Gin Khao at +65 6570 2208 to check for updated opening hours. With Christmas just around the corner, where better to celebrate than at Quayside Isle @ Sentosa Cove. Uncover many more reasons to jubilate the season of giving with your family, with exclusive promotions and dining selections that will prove to encapsulate your Christmas experience for you and your loved ones. From now till 31 December, Quayside Isle @ Sentosa Cove will be hosting a variety of dining treats that cater to taste buds across the world. Aside from BRUSSELs SPROUTS and Gin Khao Bistro, the stretch along Quayside Isle @ Sentosa Cove offers you 14 other dining concepts. Last but not least, PassportChop is doing an Instagram Giveaway! 1 lucky winner will walk away with $100 worth of Quayside Isle @ Sentosa Cove dining vouchers! Upload the photo onto your Instagram and tell us how Quayside Isle will create the best Christmas memory for you and your friends/family. This contest ends on 14th December, Monday, 2359. The winner will be announced then, all the best!